Keeping up with Whisky Squad meetings has been more difficult than usual recently, what with there being one every two weeks since the beginning of June. (Un)fortunately I’ve had an intervention of life and work, much of which was taken up with 5 days of drinking different boozes each day last week, filling all of my waking hours with Stuff and giving me no time to witter about the latest episode in the world of The Squad. However, after a few calming episodes of Babylon 5 (in which Bruce Boxleitner looks uncannily like my father, making me double take at almost every scene) and a glass of absinthe (of which more in a later post – I need to write about something other than whisky soon) my notebook has fallen open to the right page, photos have moved from camera to iPhoto and soothing musics are playing from my computer speakers. It is time to do a bit of ‘writing’. Hot on the heels of this month’s first birthday Whisky Squad the chaps managed to squeeze in another a mere two weeks later. Offered the back room at The Gunmakers for a larger than usual whisky and dinner affair they took up the challenge and matched the occasion with Diageo’s Colin Dunn, returning for his second leading of an evening. The theme this time was ‘Side by Side’ – we would be blind tasting six whiskies in pairs, with each pair having a connection, giving us three mini vertical tastings through the evening. To start us off Colin pulled out an extra aperitif from his bag. 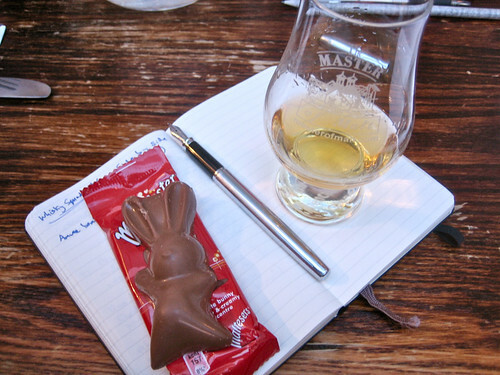 Keeping the whisky secret, as usual, he matched this with a Maltesers easter bunny and instructed us to munch, sniff and sip our way through the first glass. 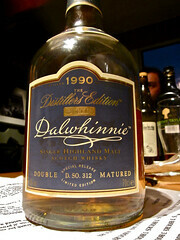 On the nose there wasn’t a lot, with high alcohols and a hint of sweet wood. The lightness continued into the taste, but with a bit more to it than the nose – a hint of rubber, sweet orange and marmelade, a little bit of ripe vine fruit, and a sour, bitter wood finish. A drop of water brought out apples and pears, icing sugar and orange cream. Noone had much of an idea of what it might be and it was revealed to be Cameron Brig. Made at Cameron Bridge grain distillery near Leven in Fife, this is one of the only commercially available bottlings of single grain whisky on the market, although it’s not particularly easy to find. 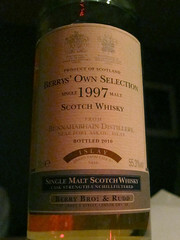 I’m a fan of older grain whiskies, but haven’t tried any younger ones before this – I can detect the flavours I like from grain whiskies in there, but they are masked by the youngness of the spirit (it’s not got an age statement, but I suspect it’s not particularly old or matured in active casks). Give this a couple more years in a barrel and I suspect it’d be right up my street. 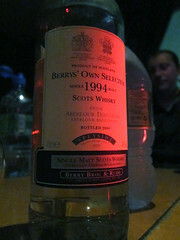 Dinner was then run in and scoffed, leading us on to our first pair of whiskies. #1 was quite a dark bronzed gold colour and had a dry nose with an underlying meatiness, hints of sherbet lemons, dry oxidised sherry (Spanish style Amontillado? ), yeast and a lick of smoke. To taste there was bread, dry fruit cake, caramel, dark chocolate, a touch of smokey spice and a sweet woody finish. Water homogenised the flavours into something sweet and bready – a red grape jam sandwich? Number 2 was light gold and a bit more aggressive on the nose, with TCP, a bit of peat smoke, sherbet lemons, sweet fruit and a bit of sticky toffee – Colin identified that last flavour as being like Blue Bird hard toffee that he used to eat when growing up. To taste it started with sweet syrup and moved through sour fruit to a sour, lingering wood ash finish and a bit of a boozey burn. Water calmed down the booze, sweetened up the middle a bit and added a bit of muddy mulch to the finish. 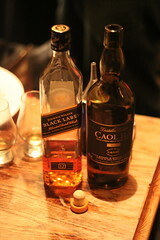 The concealing labels came off to reveal that #1 was Johnnie Walker Black Label and #2 Caol Ila Distiller’s Edition. 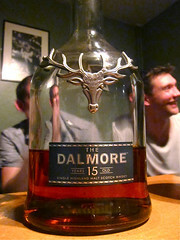 The connection was that the light smokiness in the first comes, in part, from a slug of Caol Ila in the blend, along with some Talisker and whatever else Diageo have in the smokey section of their extensive warehouses. Black Label is a fairly decent blend and does what it sets out to – have a bit of everything at the same time as being worryingly easy to drink. The Caol Ila was one that I’d not tried before, initially thinking it to be the cask strength version I tried at the Whisky Lounge Independent’s Day tasting. However, it was a bit sweeter than I remembered and that fits with the production method – the spirit is finished for 3 months in moscatel casks, adding a bit of wine fruit to the mix. Surprisingly, based on it’s current status as an increasingly respected Islay whisky (including winning a bunch of medals over the last few years at the San Francisco World Spirits competition, including ‘Best Single Malt Scotch Whisky’ for the Distiller’s Edition this year), before 2002 there were only independent bottlings, with 99% of its production going into Diageo’s blends. They released a 12, 18 and 25 year old back then and the range has continued to change and increase since, with the distillery now undergoing expansion to keep up with ongoing single malt demand. To start the next pair number 3 had a rather ‘industrial’ nose, with me picking out a light rubberiness and the rest of the table chipping in with motor oil and burning tires. Along with that were lemons, brine, marzipan and a general savoury umami. To taste there was salt, more rubber, white pepper and raisins, leading to a sweet fruit finish. Water calmed things down, with butter, bread and hot cross buns appearing. Number 4 was announced as being 14 years old, which was enough to convince me that I knew the whiskies and what the connection was. In the end I got the right distillery, but didn’t get the expression right for this one. On the nose it was rich and fruity, with wax, bananas, pineapple and glacé cherries. To taste there was lots of woody spice, rich fruit and woody smoke, with salt, a peppery burn and a lemon sherbet finish. Water simplified things to a syrupy sweetness with a hint of pepper. When the bottles were revealed it wasn’t a surprise that number 3 was Clynelish 12 year old but I was taken aback that #4 wasn’t the regular 14 year old, my favourite everyday whisky of the moment, but was instead the Clynelish Distiller’s Edition. I’ve written a bit about the distillery before, but since then it’s very much become one of my faves. I’ve got a half bottle of the 12 year old in the cupboard, will have another bottle of the 14 next time I go on a whisky buying run, and now have the distiller’s edition firmly stuck in my brain. Similar to the Caol Ila, it is a sweeter and richer version of the regular bottling, having been finished in oloroso sherry casks. 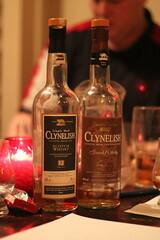 The final pair started off with number 5 and a plate of fruit cake to accompany the drams. On the nose it was quite light, with sweet cream and butter, and a bit of red fruit. 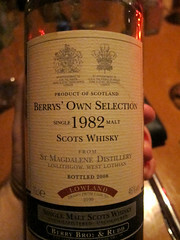 To taste it was woody, with the fruit and cream from the nose leading to a sour, but buttery, wood finish. Water didn’t help it much, knocking out a lot of the flavour and leaving it just syrupy and sweet. Number 6 had a bit more, with a nose of sweet grass, vanilla, light cream, unripe grapes, plums, stewed fruit and a hint of cheese rind. To taste it was quite green in the middle, with nettles and leaves, starting with a salty butter and ending with a gravelly minerality and quite a lot of alcoholic fire. Water killed the burn leaving the butter and gravel, and introducing some sweet and salty shortbread. Again the connection was easy to see on the reveal, with the bottles being The Singleton of Dufftown 15 year old and Dufftown 1997 Managers’ Choice. 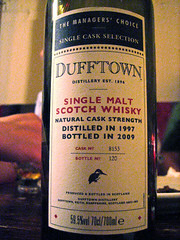 I had a bottle of The Singleton of Dufftown shortly after it came out and wasn’t that impressed, but it seems that the mix of my changing tastes and their gradual changes to the bottling over the years have matched it more closely with my likes (especially as this is a different bottling to the regular 12 year old – thanks to Jason for pointing that out in the comments). 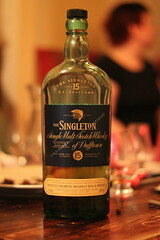 The Singleton range has a different distillery for each territory it’s released in, with Europe having Dufftown, the US Glendullan and Asia Glen Ord. The Manager’s choice is rather more interesting – a single cask selected by the manager of the distillery as a ‘distillation’ of what their spirit is about and bottled as part of a rather exclusive range of pricy bottlings. The Dufftown bottle of the range is from a rejuvenated cask, where they plane down the staves of a tired cask and retoast them to give the barrel a bit more life, and with this whisky coming in at 11 years and 11 months old and picking up a good chunk of flavour from the wood it seems to work. As the year draws to a close the season of Christmas parties is upon us. I missed my office Christmas party for the last Whisky Squad (the unblogged #8a, which involved BYOB, chocolate and some impressive drunkenness – Jason managed to write something down and then read it back again, the latter part of which isn’t quite possible from my notes) and have somehow managed to avoid any others until last week when The Squad grabbed the back room of The Gunmakers. Anyways, Darren matched up one whisky per course, choosing a dram that would work with each of the three choices available. 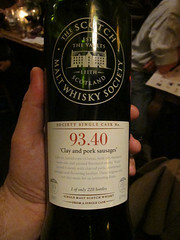 First up, although tasted blind as is usual, was The Scotch Malt Whisky Society’s 93.40 – Clay and Pork Sausages, a ten year old from Glen Scotia in Campbelltown bottled at 61.9% from a refill bourbon cask. On the nose there was roast pork and apples, salt, woody smoke and caramel sweetness. To taste there was sweet coal smoke, salt and pepper, and lemons. Water brought out the appleiness, vanilla from the cask, sour wood and more lemons. This was matched with tomato and red pepper soup, smoked salmon and crayfish roulade, and wild boar pate and worked quite well with them all – the smoky saltiness combined with some meatiness backed up the soup and pate, and cut through the creaminess of the roulade. 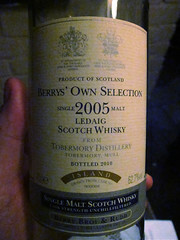 Next up was the Berry Brothers and Rudd Ledaig 2005, bottled at a shockingly (after tasting it) young 4 years. 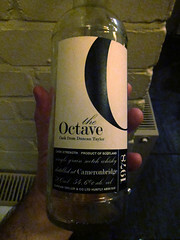 It came from a sherry cask and was a rather spicy 62.7%. This one is sold out everywhere and appeared on our list thanks to Darren finding a bottle hidden in his house. I tried it on a visit to BBR after Whisky Squad #7 and was quite impressed, but had assumed that I’d not be able to try it again, so was quite pleased to have this chance. Along with everyone saying it was great at the time the chaps at Caskstrength.net gave it the top prize in their BiG (Best in Glass) awards this month, beating a Glenfarclas 10 times its age. On the nose it had smoke, custard, salt, marmalade and meaty bbq sauce. To taste it had coal, tar, a sweet rich fruity burst and a finish of coal dust. Water calmed it down, bringing out leather and more sherried fruit, while diminishing the smoke. This was matched with roast turkey, lamb shanks, baked whiting and butternut squash pie. I can’t speak for anything but the lamb, but it went well, the rather big flavours of the whisky happily stood up to the heaviness of the meat. 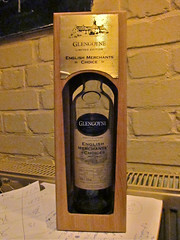 Going with dessert we had The English Merchant’s Choice 13 Year Old Glengoyne. This is a single cask whisky chosen as the second of the Glengloyne Merchant’s Choice selection, coming after the Scots version. It was selected by a group of English whisky sellers, including Darren’s boss at Master of Malt, Ben Ellefsen (there’s more about it on the Glengoyne blog). On the nose it had dark rum and nail varnish and the taste continued that with some heavy bitter wood and rubber, all with a demerara sugariness underneath. Water revealed some bitter orange rind along with the rich rumminess. 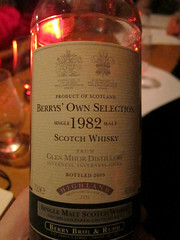 Despite my love of sherried whisky, this one was a bit much for my liking – too much wood swamping the rich sweet fruit. This was matched with Christmas pudding, mince pies and some cheese, all of which went well. The richness of the whisky matched up with the fruit of both the pies and pudding, and cut through the fat of the cheese (even making me appreciate a blue cheese for the first time ever). As a post dinner dram Darren unveiled The Octave 31 Year Old Cameron Bridge, a single cask grain whisky bottled by Duncan Taylor from a first fill bourbon cask at 54.6%. On the nose this one had a thin sweetness, with raisins, acetone and citrus syrup. To taste it had spicy, but controlled, wood, vanilla pods and a short finish of sugary wood. Water brought out more vanilla and cream, revealing school dinner custard, grape jam and a spicy woody finish. This was my favourite of the night, showing me that the bits of well aged grain whisky that I like are common between sherry and bourbon casks and thus due to the nature of the spirit rather than the wood it’s aged in. Unfortunately with only 70 bottles released I suspect I won’t be finding any more. Now we come to the quiz. Composed of three rounds, a picture round and two of written questions and answers, it was marked out of 50 and was rather tough. I lucked out and had Rob and Rocky from Berry Brothers on my table (their experience was offset by our team size of 3 compared to everone else’s of 5, was our claim) and we quite convincingly won with a score of 40. We picked up some miniatures of whisky as well as accusations of cheating – the peril of having Darren (writer of round one) on our table as well (although being good and not taking part in the quiz). Anyways, winners! So, Whisky Squad continues from strength to strength, with January’s session already sold out, but keep an eye on the website for February’s meeting. Campbelltown single cask single malt Scotch whisky, 61.9%. Sold out, was £42.20 at the SMWS. Highland single cask single malt Scotch whisky, 62.7%. Sold out. Highland single cask single malt Scotch whisky, 54.1%. ~£100 at Master of Malt. Single cask single grain whisky, 54.6%. 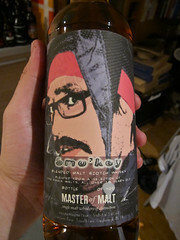 Sold out, was ~£75 at Master of Malt. A bit of a unexpected move by The Whisky Squad this month. Having gone through various high powered single malts this meeting’s theme was to be the whisky snob’s enemy – the much maligned blend. The idea behind this was to help further put down the theory that blended whisky is by its very nature inferior to single malt. 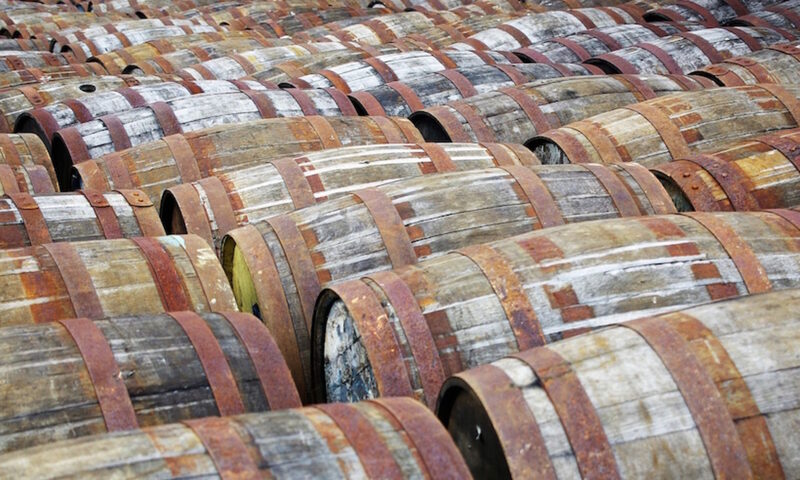 Granted there are a bunch of rubbishy blends out there, but with blended whisky still making up over 90% of the whisky market they must be doing something right. Single Malt Whisky – Whisky from a single distillery made with malted barley. Blended Malt Whisky – Single malt from a variety of distilleries blended together. Single Grain Whisky – Whisky from a single distillery made with any grains. 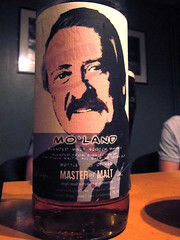 Blended Whisky – A mixture of grain and malt whiskies. While many within the whisky appreciation world look down on blends the art of blending whisky isn’t something to be sniffed at (bad pun acknowledged) – to take a potentially large number of component whiskies from a variety of sources, all of which might change in quality, quantity and flavour between purchased batches of barrels, and then mix them together to create a consistently flavoured product in potentially large quantities is a serious skill. I still drink mainly single malt whisky but my prejudice against all blends has been hit on the head in recent times and this tasting certainly helped kick it further out the door. The first whisky, tasted blind as is tradition, had loads of vanilla on the nose, along with a slab of wood at the back and a bit of floral oil. 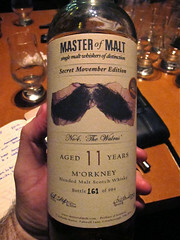 To taste it was lighter than the nose suggested with lots of wood leading to a spicy finish. Water brought out a lot more flavour with creamy custard, a little bit of fruit and a dry woody finish. Not the most complex of whiskies but quite happily drinkable. The paper sheath came off to reveal that it was Bailie Nicol Jarvie. Named after the bailiff from Rob Roy this is Glenmorangie’s blend and the whisky that my flatmates bought me for my 21st birthday. While the complete recipe is secret we heard that it at least contains malt whisky from Ardbeg, Glenmorangie and Caol Ila (although an unpeated version rather than their regular peated spirit), and grain whisky from North British. It’s one of the only blends known to have a good chance of containing Ardbeg, although as Glenmorangie and Ardbeg are both owned by the LVMH group it’s fairly obvious how they get their hands on it. Like most blends it does have caramel added to the mix for colour, but in this case (as it’s quite a light whisky) it’s very much more for consistency between batches than darkening younger spirit to make it look older (as the ‘older whisky is darker and better’ meme runs deep within whisky buying society). Darren’s quite a fan, buying some each Christmas for doling out to all and sundry during the festive season. He also recommended it as an accompaniment to creamy coffee. Number 3 was the one I’d been waiting for – having been given a bit of a sneak preview of the whiskies a few weeks before this was the one I had remembered. On the nose it had gummi cola bottles (a flavour that I have ranted about being distinct from cola drinks for a while. Don’t ask me about it in real life, I can talk for up to half an hour on the topic), an acetoney tang, pine needles and Copydex glue. It also had a slightly meaty undertone to everything. To taste it had an initial burst of sweet pineapple and kola cubes with a strong lemoniness, followed quickly by a tannic dryness and a prickly dry wood finish. Water helped, with more fruit appearing on the nose. The taste had more sweetness and the lemony citrus became more orangey. The dryness retreated, although was still present, and the finish was still very woody, but I also got some salt and menthol in the middle. A bit of a strange one this and one that I’m not sure I liked. 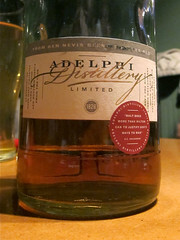 It was revealed to be an Adelphi bottling of single cask Ben Nevis. 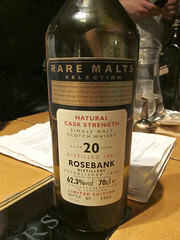 The special thing about this cask was that it had been filled with a mix of malt and grain whisky, both produced at the distillery as they had a continuous still installed for grain production in the 1950s in addition to the pot stills for malt production, and then left to mature for 34 years. Thus it is a single cask blended whisky, bottled at cask strength, a very uncommon beast. Ben Nevis didn’t have the greatest of reputations in the past, with this going in the barrel in 1970, but they were bought by Nikka in 1991 and quality has been rising ever since. 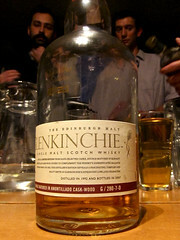 While I’m not sure I’ll seek this one out again it was a very interesting drink – unlike any whisky I’ve tried before. There was a little bit of it left behind the bar at The Gunmakers, so there’s a chance you might be able to try it if you get over there soon (before I decide I need another taste). 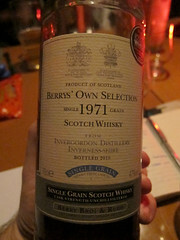 The final whisky of the night was one that I had no clue about at all. On the nose it had grapefruit, cordosyl mouthwash, cucumbers and single cream. To taste there were walnuts, coconut husks, liquorice root and cream, all tied together with a woody rubbery smokiness. Some water brought out salt and citrus on the nose and wood at the back of the palate. There was creamy pine, dark chocolate and tea, with delicate wood on the finish. 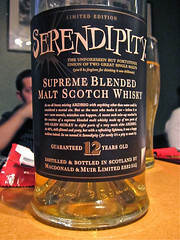 Again the paper was torn off, this time to show a bottle of Ardbeg Serendipity, a blended malt. This is no ordinary blended malt, having come about (so the story tells it) by accident. Back in the days when Ardbeg was newly reopened they decided they needed to raise some cash, so prepared to bottle some casks of 1977 Ardbeg (about 25 years old at the time). They transported it to the vatting plant and turned on the taps to dump it into a tank ready for bottling only to discover that the vat wasn’t empty. So it was that they mixed four parts of an old and rare Ardbeg with one part of 12 year old Glen Moray (also owned by the LVMH group at the time). There is a cynical view that this was a story dreamed up by Ardbeg’s rather creative marketing department to explain away the strengthening of some spirit that had dropped below 40% ABV during its maturation (as 40% is the legal minimum that a spirit can be and be called whisky) by dosing it with some stronger, younger, cheaper Glen Moray. Whatever the truth, its price has risen and fallen as it has been snapped up by collectors and merchants over the years, having settled recently at a respectable £70ish a bottle, even though they can only put “12 years old” on the label. Anyways, yet another interesting selection of whiskies, although happily not as potentially financially crippling as previous months – I already have a bottle of Hedonism (which gets drunk slowly due to my fear that I won’t like it when I open it) and my other favourite of the evening was the very reasonably priced Bailie Nicol Jarvie. I may not wait until Christmas until it joins the illustrious selection of boozes in my cupboard. 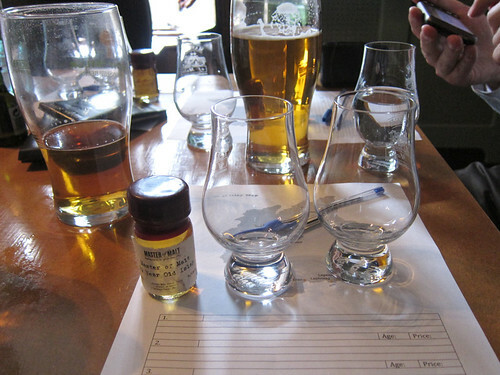 Whisky Squad organiser Andy already has a blog post up, as does Whisky Guy Darren. It’s incredible how important one’s sense of smell is when tasting things. I have, of course, heard from numerous people (including my anosmic mate John) about how taste is predominantly smell, with the tongue painting in wide strokes while the nose adds the detail, so it was rather annoying to discover the actual extent to which my own sense of taste is reliant on my nose on the same day as I finally made it along to a Whisky Squad tasting. 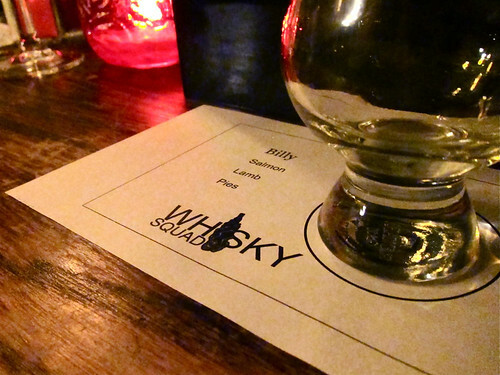 The Whisky Squad is a monthly meetup set up by Andy of Good Drinks Etc and Jason B. Standing to be more informal than most of the tastings out in the wild, with a focus on learning, talking about whisky in a small group and generally having a good time. With assistance from Darren, The Whisky Guy, as whisky expert (a title he veraciously denies, despite working for Master of Malt and having hours of whisky related anecdotes to roll out at the drop of a segue) and moustache wearer extraordinaire, they take over the upstairs room at The Gunmakers (thanks to Jeff the easily bribed with whisky landlord) on the first Thursday of each month to taste through a bunch of whiskies focused around a theme. This month’s was Islay, Andy having just returned from a weekend up there and thus laden with bottles. Islay is one of the most concentrated areas of whisky production in the world, with 8 distilleries dotted around the 240 square miles of the island floating just off of the Kintyre peninsula on the west coast of Scotland. Famed for their peaty whiskies it’s a bit of a whisky connoiseurs paradise, with each of the distilleries a short drive from each other and each offering something quite different. I wandered along certain that my worst day of hayfever in about ten years wouldn’t hinder the tasting of pungent island malts. However, within seconds of the first dram being placed in front of me my worst fears were realised – I could smell nothing at all. Even the strongest snort did nothing but hurt the back of my nose as the physical reaction to the alcohol remained, but no twitch of sensory cells to inform me of what I was sniffing. Luckily, Andy acted as my seeing nose dog, pinging me tasting notes, and I grabbed a couple of samples to take home and try later on. First up was a sample from Master of Malt to keep us going while Andy and Darren kicked off the evening with some talk of Islay and the makings of whisky. 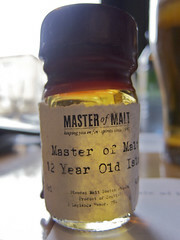 The Master of Malt 12 Year Old Islay is a blend of malts from the island and is peated to about 15ppm. On the nose it has bitter-sweet peat, a touch of sweet wood oil and digestive biscuits. 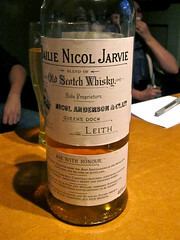 To taste the peat is more subdued and joined with a hint of woodsmoke and wet cardboard. There’s a bump of malty sweetness in the middle, with a touch of orangey citrus, before a it trails off into a subdued, short caramel orange finish. Water brings out some vanilla sweetness to fight against the wood smoke, adding a prickly damp bonfire edge to the taste. It’s smoky and peaty, with a hint of citrus and some sweetness – a classic example of what is thought of as a ‘typical islay malt’, even if such a statement doesn’t really mean anything, as the whiskies to follow will demonstrate. 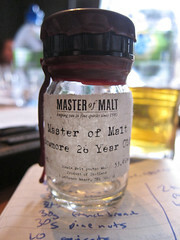 As a special treat before we started the tasting proper was a very small amount of Master of Malt Bowmore 26 Year old, accompanied by a parma violet. Unfortunately I didn’t get anything off the glass other than a burnt nose, but it was quite obvious to everyone else why a parma violet had accompanied it – it has a distinct sweet violet smell sitting in amongst the other flavours of a sweet shop. 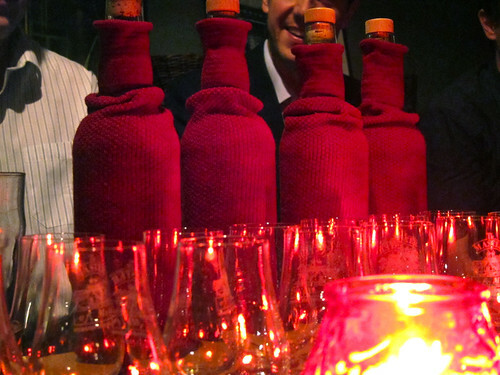 The whiskies that are put on for the tasting, excluding random samples and donations, are tasted blind, with paper wrapped around the bottles to obscure labels and details, in an attempt to remove prejudices and prejudging of the flavours. Unfortunately for me I recognise the bottle shapes of most Islay distilleries, but having no sense of smell this was my main way of trying to work out what everyone was drinking before the big reveal. 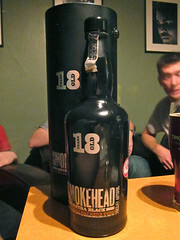 Next up was a bottle that I didn’t recognise, the Bunnahabhain 18 Year Old. The Bunnahabhain (bunna-har-ven) distilleryis unique amongst those of the island in that its standard expression is pretty much unpeated , coming in at 1-2ppm. They do, however, produce a good quantity of peated spirit but other than for special bottlings this generally goes to other companies for blends, including Black Bottle which it makes up a significant component of. Andy had picked this up at the distillery, along with an armful of leaflets, maps, tasting note cards and other assorted propaganda, and had really liked it due to it being so different to the peat heavy assortment that he tried up until then. From everyone else’s tasting notes it had cheap chocolate brownies, honey and sherry trifle on the nose and was dry and woody to taste, with a salty buttery finish. To follow this we moved on to the Bruichladdich Peat, a whisky that was difficult to tell from the bottle shape alone due to the distillery’s habit of doing so many releases – it was suggested around the room that it’s almost as if whenever Jim McEwan, the production manager, has a crazy idea they drop what they’re doing and make a batch of it. The Peat is a back to basics version of Bruichladdich – peated to ~35ppm, matured in bourbon casks for an unspecified amount of time and bottled without any of the finishes that have become their trademark in recent times. The notes I have for this are that it combines peat and wood smoke on the nose, with a nice balance of the two combined with some sweetness and dry vanilla wood to taste. One that I want to revisit, as I’ve been a fan of all the ‘Laddies I’ve tried so far. This one brought up a point for discussion – the difference between peat and smoke. As peat is introduced into the malt by way of smoke people often assume that the two flavours are the same, but there is a distinct difference. In addition to peatiness there is also smokiness in the flavours introduced by the barrel used for maturation and this is a different kind of smoke to that introduced by the peat. Generally the peat will bring in more medicinal flavours, such as the TCP-like tang that Laphroaig is known for, or a sweet smoke, such as with Bowmore, whereas the wood will bring in more campfire tastes and smells. As ever, the various different bits of the whisky making process, from water to finishing, all have their effect on the finished product, all working together to produce interesting flavours. After this I threw my contribution to the evening into the ring – the remains of my young Kilchoman sample, which Darren identified as having been in wood for 6 months. Kilchoman have recently produced their first 3 year old bottlings to quite a lot of acclaim (I have a bottle of an upcoming Royal Mile Whisky single cask bottling reserved, as recommended by Jason, which I’m very much looking forward to) and their new spirit is a great indicator of how Islay whiskies mature in the barrel. I usually describe this as tasting like ‘cattle feed and death’, but with a bit more delicacy it has lots of malty grain with sweet peat and a hint of woodiness that isn’t particularly developed in this young sample. After that interlude we got back on to chosen whiskies with a Caol Ila 10 year old ‘Unpeated’ expression. Strangely for an evening of Islay malts half of the whiskies we tried weren’t heavily peated, with this one having little or no peat in at all, rather than the usual ~15ppm that the distillery uses. I grabbed a dram of this to take home, Caol Ila being a whisky that I’ve been intrigued by in the past (with a cask strength Tokaji finish being one of the most orangey whiskies I’ve ever tasted). On the nose there’s candy floss, a wisp of smoke and something almost toffee appley. To taste it has dry prickly wood, orange juice concentrate (a flavour that I’ve found to be especially strong in the Caol Ila’s I’ve tried) and sweet wood smoke. It’s cask strength, at 65.8%, so can happily take some water which opens the nose to add more oil and sweaty socks and a slab of sweetness to the taste, along with some coal dust, bitter oak, sweet butter and orchard fruitiness. A fearsome dram neat, but one that mellows nicely with water. The citrus nature of many of the Islay whiskies seems a bit strange, but Darren explained it as coming from the saltiness inherent on being matured on the island. The salt interacts with the wood of the barrels creating citrus-like flavouring compounds which are picked up by the wood, thus introducing not only briney notes into the whisky but also the lemon and orange flavours that are often present. Next was the last of the night, which by a process of elimination was the distillery only edition that Andy had promised us – Lagavulin Distillery Only 2010. 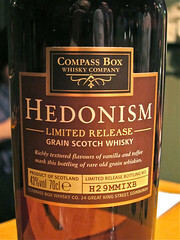 This is a cask strength bottling that you can, as the name suggests, only get from the distillery. 6000 bottles were produced and it was released in time for this year’s Feis Ile. Along with the limited nature of the bottling it’s also quite special as it was finished in port casks. On the nose it’s pure Lagavulin, with seaweed, brine, a background of sweet peat and a hint of meatiness. To taste it’s spicy, with the port wood very obvious at the back of the mouth. It has seafood risotto, seawater, caramel covered twigs and a mixed spice tail. A drop of water takes the edge off of the prickle, bringing out big sugary sweetness, revealing the background woody savouriness and adding a chunk of smoky sweetness, like burned sugar. This is a really rather special dram and one that it’s worth going to the distillery to grab. An interesting array of whiskies, with only 2 of the 4 actually being particularly peaty, showing just how big a range Islay actually produces. The guys know how to run an evening and having finished the tasting the conversation continued in the Gunmaker’s bar until the pub closed. I’m signed up for the next one (and am even missing a day of the GBBF to make sure I can go) which should be an evening of summer whiskies with Diageo’s Colin Dunn, who led the Talisker tasting I went to last year, which promises to be an event – putting Colin in a small room strikes me as a recipe for enthusiasm overload, in a good way. Islay single cask single malt whisky, 65.8%. £51.95 from Master of Malt. 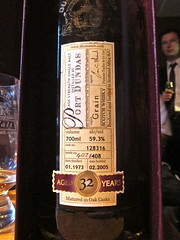 Port wood finished Islay single malt whisky, 52.5%. Only available from the distillery – £70 for one or two for £130. 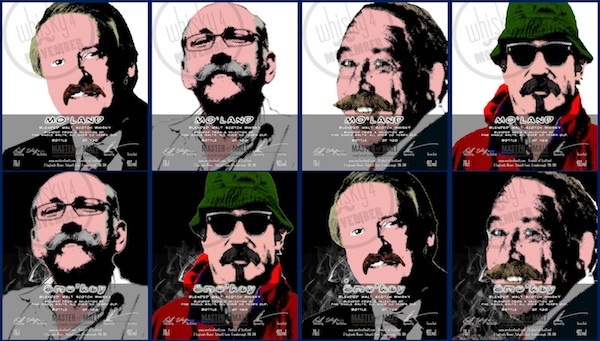 If you want to come along to a Whisky Squad tasting then keep an eye on their website and sign up when they announce the next event. The group is small (~15) and it’s first come first served, so you need to be quick. They do run a waiting list so it’s worth letting them know even if they have run out of spots.